OW 2012: And the Nominees Are . . .
Academy member Jennifer Lawrence and AMPAS president Tom Sherak announced this morning the Academy Award nominees for last year's films. The 2011 Academy Award nominations were announced early this morning (3:30am Hawaii Time) and I wanted to give my first impressions on them. Since I’m writing this right after I read the nominations these are literally my first thoughts on this year’s nominees . . .
For the past two years The Academy has nominated ten films for the Best Picture category. After last year’s ceremony it was announced that going forward (starting with the 2012 ceremony) there would be between five to ten nominations for the category, provided that a film earned 5% of first-place votes during the nomination process. 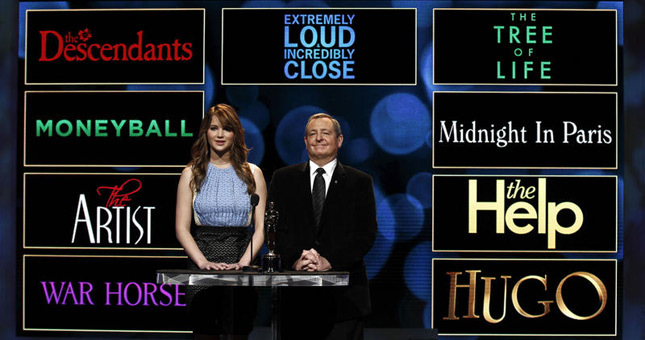 Going in to this year’s nomination announcement, Oscar pundits weren’t exactly sure which films would be nominated since there was no set nomination number. Granted, at minimum there would be a minimum of five, but would five other films gather enough first place votes to give the category the full ten nominations? If I had to say, I don’t think anyone was thinking we would have nine nominees, especially since most people considered 2011 to be a down year in cinema. While there are some titles on the nominee list that were to be expected (The Artist, The Descendants, Hugo), I definitely know of two that I think will be considered “surprises” by Oscar prognosticators. The 9 nominees for Best Picture. Those two surprises being The Help and Extremely Loud & Incredibly Close. The reason I say that The Help may be considered a “surprise” is because I hadn’t heard it being mentioned at all as potentially snagging a nomination in the Best Picture category. However, going back to having nine nominations, obviously the more nominations there are the more chance there is for surprises like The Help to be nominated. While we’re on the subject of The Help, it definitely is the most mainstream nomination in the group as it is the only nominee in the group to have brought in over $100 million in box office grosses ($169 million to be exact). That distinction definitely makes it a mainstream pick since it’s the nominee that has been seen by the most people. The other surprise I think is Extremely Loud & Incredibly Close. I’ve been saying that this film has Oscar bait written all over it, however, there has been almost zero Oscar buzz on this film since its limited release last month. The film also failed to snag any Golden Globe, Directors Guild, Writers Guild, or Producers Guild nominations (usually good indicators of what films will be nominated for Academy Awards) and so I’m sure many will consider Extremely Loud’s Best Picture nomination to be a surprise. The rest of the field though I feel is pretty standard Oscar nominee fare and a pretty good mix with films by great directors (Spielberg’s War Horse and Scorsese’s Hugo), art house faves (The Artist, The Tree of Life), big studio pictures (Moneyball), and art house crossovers (Midnight in Paris, The Descendants) all in the mix for the top prize. The Artist is definitely the one big blind spot in my Oscar viewing that I need to rectify sometime soon. Though my heart is with Alexander Payne (this is going to be a recurring theme here in my support for The Descendants) I can definitely see Woody snagging this award as I thought he wonderfully brought to life a number of different characters. Ugh, a category that I’m grossly unqualified to talk about since I’ve only seen two of the nominees in action: Viola Davis in The Help and Rooney Mara in Dragon Tattoo. However, you have the always great Meryl Streep also nominated and even though I haven’t seen her performance, I’m sure it’s worthy to be listed in this category. Despite the media circus surrounding Clooney & Pitt and their “at odds” storyline that the media is hyping between the two, I do think they are the front runners having not seen anyone else in the category. I won’t be surprised if I see either of these two win. Ok, what even sadder about my viewing of performances for this category is that I actually only seen one film, The Help, which has two supporting noms. Octavia Spencer is probably the front runner since she did already pick up a Golden Globe just last week for this same category. Hopefully I’ll have more to report back after seeing The Artist and maybe Netflixing Bridesmaids. What I love about this category is the variety of films that these nominees come from. While Jonah Hill and Christopher Plummer were somewhat expected, seeing Nick Nolte nominated for Warrior is great to see as his performance was pretty good in that film. Max von Sydow’s nomination is also contributing to the Extremely Loud “surprise” that I mentioned earlier. Again, a nomination for that film seemingly coming out of the blue. Hugo led the way in receiving 11 nominations with The Artist close behind at 10. Close to my heart, The Descendants picked up five. The one nomination that I was hoping for that seemed like an outside chance of happening was for Shailene Woodley to pick up a nod for best supporting actress. I thought she was really great in The Descendants and there was some early buzz for her performance. Another favorite for me from this year that didn’t fair well with the Academy was Drive, picking only a lone nomination for Sound Editing. One big thing to remember is that not everyone in Hollywood gets to vote for The Academy Awards. Only members of the Academy of Motion Picture Arts and Sciences (AMPAS) get to nominate and vote in the Academy Awards process. Who’s in the Academy? An official listing has never been disclosed, but just being nominated for an Academy Award gets you in (for a better idea, here’s a link to the AMPAS entry on Wikipedia) Having said that, Academy members are not your average moviegoers so predicting the nominations and then the awards does have quasi-science to it since you’re trying to get inside the head of Academy voters. This is also a reason why Oscar winners and nominations never fully match up with the expectations of critics and your average moviegoers. Look for Oscar coverage to continue here at the Red Band Project during the next month as we gear up for the awards ceremony on Sunday, February 26. Until then I leave you with one of only two of the nominees for Original Song for this year’s awards . . . Man or Muppet from The Muppets.